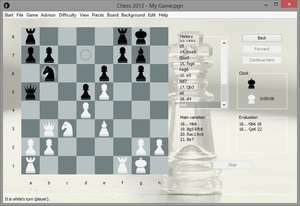 This modern-looking chess application will let you dive into the world of exciting chess games. Pick your difficulty level and see if you can beat the PC. Feel free to undo your move if you make a mistake. Chess 2013 records the moves in the standard chess notation and lets you jump to any point in the game. Chess 2013 2013.8 is a shareware program and can be used as a demo to try the software until the free trial period has ended. A full version of the program is available after the trial period ends. For security reasons, you should also check out the Chess 2013 download at LO4D.com which includes virus and malware tests. Additional screenshots of this application download may be available, too.